Preparing and placing dental implants has traditionally been a lengthy process. Today, however, the time commitment required to improve your smile has been drastically reduced to a few hours at the dentist plus the standard recovery period. While not everyone is a candidate for same day dental implants, those that are, no longer need to experience multiple surgeries with several month recovery periods in between each one. Same day implants help an individual return to normal life faster and are the most effective method of restoring a fully functioning set of teeth. One of the most significant benefits to same day dental implants is the focus on you the patient. Your overall experience is significantly improved thanks to the short, one visit procedure with a reasonable recovery period. Dental implants, in general, carry many benefits including; improved facial structure, ability to eat a more healthy balanced diet and increased self-confidence. While the benefits to dental implants and same day procedures are many and significant, it is still a surgery, and all surgeries come with a certain degree of risk. Most commonly, the risk for patients is implant failure. For patients who qualify for the same day procedure, the implants will be done all at once. Traditional methods create a solid tie between the implant and the bone before adding a crown that will receive pressure and stress when eating. Same day implant recipients success rates depend largely upon their ability to follow their dentist’s instructions for minimizing stress on their new dental implants. Are Same Day Implants Different Than Traditional Implants? Dental implants in a day, use only 4 implants per arch, whereby traditional implants use anywhere from 6 – 8 implants, or more, on each arch. The same day implants in this procedure are placed at an angle, allowing for increased contact by utilizing the natural support of the bone. Unlike traditional dental implants, this procedure will require no bone grafting for most patients. Same day dental implants can vary in procedure duration. However, the surgery will take around 2-1/2 hours per arch. 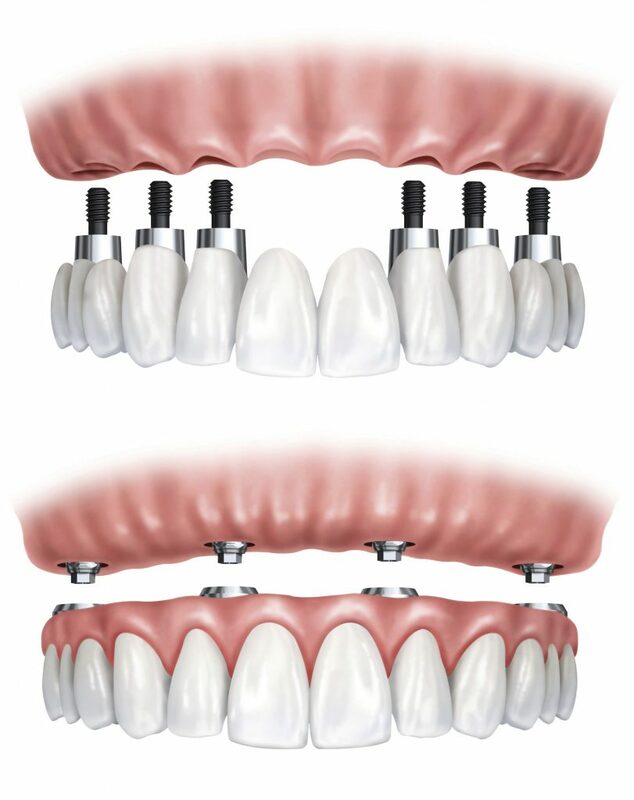 Both forms of dental implants maintain a 98% success rate. For most of our patients, if they are able to, the same day procedure is highly desirable over traditional methods. If you’re interested in getting dental implants installed start to finish by highly experienced specialists who can replace your missing or broken teeth, call us today to schedule an appointment so we can answer any questions you might have about dental implants. Our expert and caring staff would love to give you the smile of your dreams!